As many of you know, I have been working from Oakland, California, for the past year. 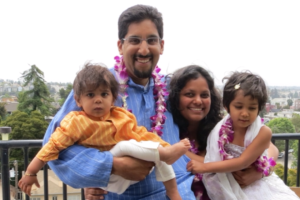 During this time, my family has also grown to include two amazing children, Maya and Rohit. I have now decided to make my move to Oakland permanent and shift my role at IDP from Co-Director to Managing Attorney, Defending Immigrants Partnership. In this capacity, I will continue to coordinate our work with the Defending Immigrants Partnership (our national collaboration with Immigrant Legal Resource Center and National Immigration Project) to implement the historic Supreme Court decision in Padilla v. Kentucky. I am thrilled to also announce that Michelle Fei will now serve as IDP’s Executive Director, and Alisa Wellek will step into a newly-created Deputy Director position, where she will both continue her substantive program work and build our organizational strength. Keep an eye out for a message from Alisa about how you can continue to support our mission! As I move into this new role, I’ve been able to take a step back and reflect on what we have accomplished since IDP moved from being a project of the New York State Defenders Association (NYSDA) to a more independent organization just four years ago. We have tripled in size, growing into an amazing, committed, and creative staff. This has helped enable us to become more impactful: we’ve brought new allies into our struggle; celebrated litigation victories at the Supreme Court; fought to delink the deportation and criminal justice systems; and resourced attorneys, community-based organizations, and immigrant leaders to make real differences. While I am proud of what we have accomplished, we all know that attacks on immigrants labeled “criminal aliens” are growing, and the criminal justice system continues to be the focus of deportation policies. That’s why I’m excited that these staff transitions will help us even more effectively promote a robust impact of Padilla, fight deportation programs like so-called “Secure Communities,” and aggressively litigate the government’s misinterpretations of already-harsh immigration laws. Through all of this, we will continue to build and use principled messaging to advance our mission and equip our communities with comprehensive tools to fight the targeting of immigrants with criminal arrests and convictions. I am excited to remain a part of the IDP family – and together with you – as we continue to make great strides in this struggle.